“Simply Classy and Beauty”, it’s how we illustrate our new release bag,Voila Serena Women’s Leather Handbag, a classy, elegant, classic, simple medium sized handbag & sling / sling / crossbody bag for women handmade by our experienced leather craftsmen. 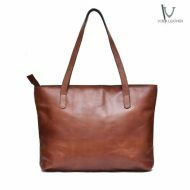 Voila Serena Women’s Leather Handbag is made of soft charactered, genuine premium Nappa cow leather combination with Full grain cow leather, designed simple in tobacco and camel color combanation, and with one zippered pocket complementing its frontside. 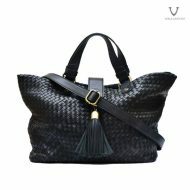 Voila Serena’s roomy interior is wrapped with soft, smooth, classy quality cotton polyester for your valuables safekeeping, and completed with one medium zippered pocket and two small pouches. Voila Serena can be carried crossbody using its available shoulder strap if you’re not in the mood to carry the bag by its handle or on your shoulder. 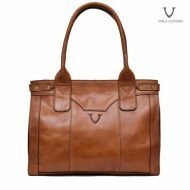 Voila Serena Women’s Leather Handbag, a classic, vintage, elegant, strong, sturdy, long-lasting handbag for you, classy genuine leather bag lovers. Voila Serena is a perfect companion for going to the office, to parties, or hanging out with friends, family, and colleagues – it is suitable matched with feminine fashion, office / business attire, even casual outfits. 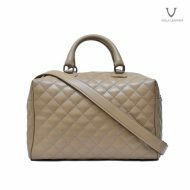 If you are looking for a classy, strudy, simple, classic designed genuine premium leather bag, Voila Serena Women’s Leather Handbag deserves a spot in your bag collection shelf.